One of the largest issues that we see in the technical ministries today is the fact that those involved don’t know the authority structure of the ministry. We have seen ministries that seem to “have it all together” and overall run a tight ship, but when it came to their technical ministries, things were just kind of thrown together with no real structure. 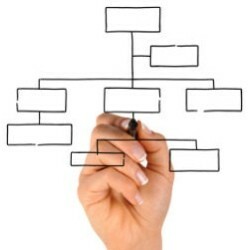 In a corporate setting we would expect a company to have an organizational chart of some kind with a clear chain of command. “Who does what” would be clearly laid out. But let’s think about it, what is one of the most frustrating things to us in the secular workplace? Lack of organization and structure in the workplace! So why would we think it would magically be any better in our ministries? Let’s ask ourselves this question: Is God a God of order or is this world just kind of thrown together? And should not Christ’s body, of all places, follow the model set forth by the Creator Himself? In small ministries the structure of authority will be fairly simple, but in larger ministries it can sometimes get a little complex. When we go into a church to help them one thing we always cover in our training seminar is this topic, and in over 15 years of training seminars only one ministry actually had it together, and knew who was in charge, who answered to whom, and who did what. So this is a fairly common problem to say the least! This is not a decision that needs to be taken lightly, but rather it needs to be taken into prayerful consideration! The church leadership needs to be involved in making these decisions, and those who accept the responsibilities of leadership, whether staff or layman, need to take their position seriously. OK, so now we know who’s in charge and whom we answer to, but who does what? It’s not healthy for everyone to do everything! Now, saying that, I think cross-training is a great thing so, for example, the video guy has a working knowledge of the audio side of things so that if he’s working on Sunday’s video project during the week he does not have to have the audio guy there just to check sound. Or if the video guy is running late fighting traffic, the audio guy can get the morning announcements rolling on the screens. But each team member needs to know what his specific job is, what is expected of him, when he is expected to be there, and what the requirements of his post are. You say, “But they are volunteers!” And to that we say, “Uhmmm, yep. That is when it is the most important!” Now these “job descriptions” do not need to be extremely elaborate, but they need to be detailed enough so that everyone is on the same page. Many times our problems in technical ministry are not just technical. Often they are brought on by the lack or order and organization in our area of ministry. We are all responsible to be certain that we settle this problem, and work together with our church leadership to get these things decided. Now, Pastor, you’re not off the hook on this one. 🙂 As God’s appointed leader and shepherd of your flock, it is ultimately your responsibility to see that not just your Sunday School and decorating committees are run in an orderly way, but also the tech ministry. Do you know what shape your technical ministry is in? Just because that is assigned to another member of the pastoral staff, doesn’t mean that you yourself shouldn’t occasionally just poke your head in the booth before the Sunday service, attend one of monthly tech meetings, or just ask your techs to be honest with you and tell you if things are being done decently and in order. Ask them if there anything you do that just bothers them to no end. Or, if they could change one thing, what would it be? A little bit goes a long way in this! As always if you have questions, or just need someone to to talk to about these things, please don’t hesitate to contact us! We’ve helped lots of churches and we’d love to hear from you!